A couple of notes on the text. When Mr. Smith uses the word ‘Keltic’, he is referring to the period now known as the Iron Age. The woman and child are probably Late Neolithic or Early Bronze Age. The barrows are not in fact where the Historic Environment Record have recorded them, but lie south-east of this point, either side of the club house of the golf course (see map). The following text is taken from From Worthington George Smith’s ‘Man, the Primeval Savage – His Haunts and Relics from the Hill-tops of Bedfordshire to Blackwall‘ (1894). 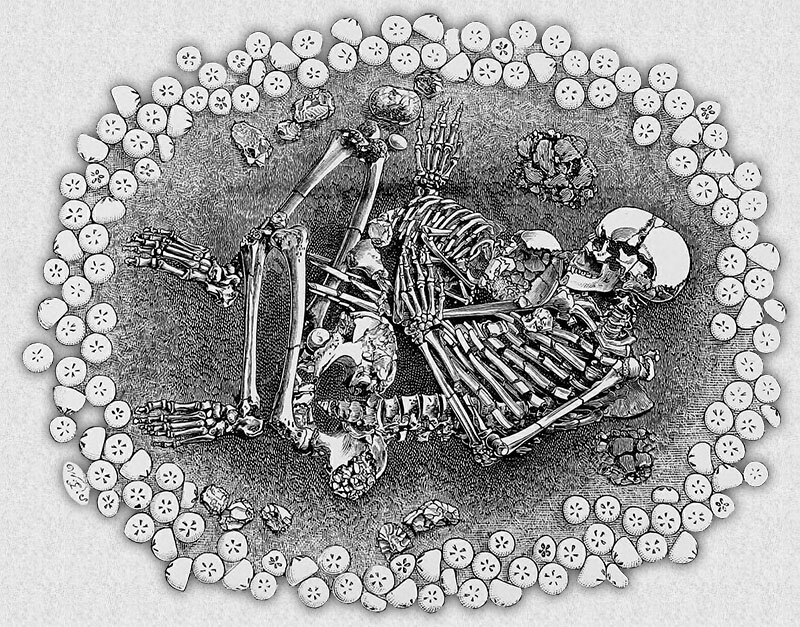 In opening the graves found under the round Keltic tumuli on the hills, it does not always follow for certain that the human bones belong to the Kelts of old. 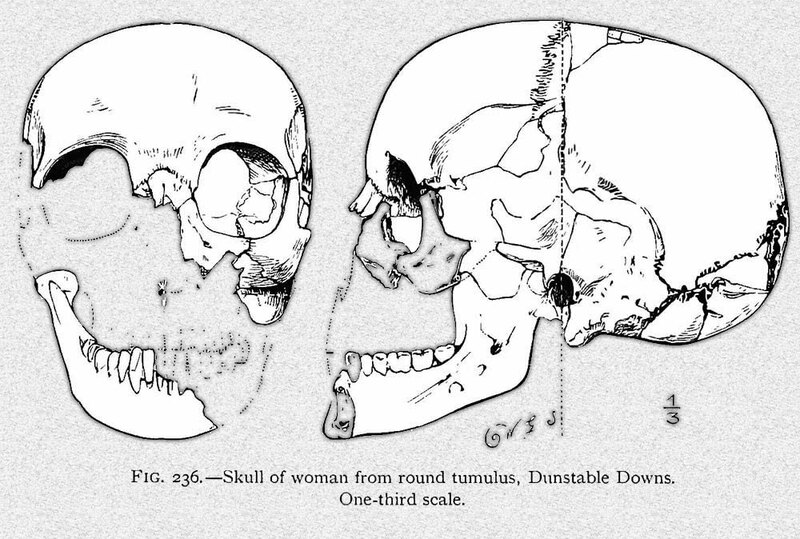 I have two skeletons, extracted by myself from round and now ruined tumuli in cultivated fields on Dunstable Downs. Of the age of one of these, a presumed boy, I am uncertain; of the other, a young woman with an infant, I feel sure of being Keltic from its peculiar surroundings. The boy was dug by me out of the edge of a ruined round tumulus in May 1887, in a cultivated field on the flat downs. The site is a thousand yards south of the five knolls tumuli, but on the east side of the road which passes over the downs. It is tumulus No. 7 on map. The mound was originally 46 feet in diameter. There was originally a central grave and six or seven other graves round the central one. All the graves were small and shallow; none had been excavated into the chalk; the drift only, a foot or 18 inches in depth, had been excavated. After the interments were made, the drift was thrown over the bodies, and a vast quantity of chalk rubble was brought from a distance to make up the tumulus. When the burials in the circumference took place, the drift and chalk rubble were again dug into, but the solid chalk was not touched. All the graves at the time of my examination had been rifled, except one to the north. A few pieces of the leg-bones belonging to one of the rifled graves came to light. The boy found in the undisturbed grave was on his left side, and quite flat. The pieces of bone extracted numbered 443. The skull was in sixty-five pieces. The skeleton, as seen in the grave, is illustrated on Fig. 234. Near the face three flint flakes are shown ; a represents a nodule of iron pyrites with two flakes, one scraper- like, below. All the teeth belonging to both jaws had fallen out; the lower jaw was in five pieces, and the two uncut and imperfectly developed third molar or ‘wisdom’ teeth had fallen from their cavities or alveoli. The teeth, which were all recovered but one, and bones, showed the boy to have been about fourteen years of age; each humerus or upper arm bone was naturally in three pieces, i.e., the head or shoulder end, and lower extremity or elbow end, were both naturally free from the shaft; the head of the bone forms one with the shaft at twenty years, and the lower extremity with the shaft at sixteen years. The head of each femur or thigh-bone was also free ; these become attached at about twenty-five years. The thigh-bone measured 1 ft. 1.5 ins., giving a height of 3 ft. 7.5 ins. for the owner when alive. The cephalic index was 85, showing the boy to have been distinctly brachycephalic; the skull was slightly oblique, caused by the pressure of the tumulus on the head after death, or possibly by one-sided carriage by the mother during infancy. 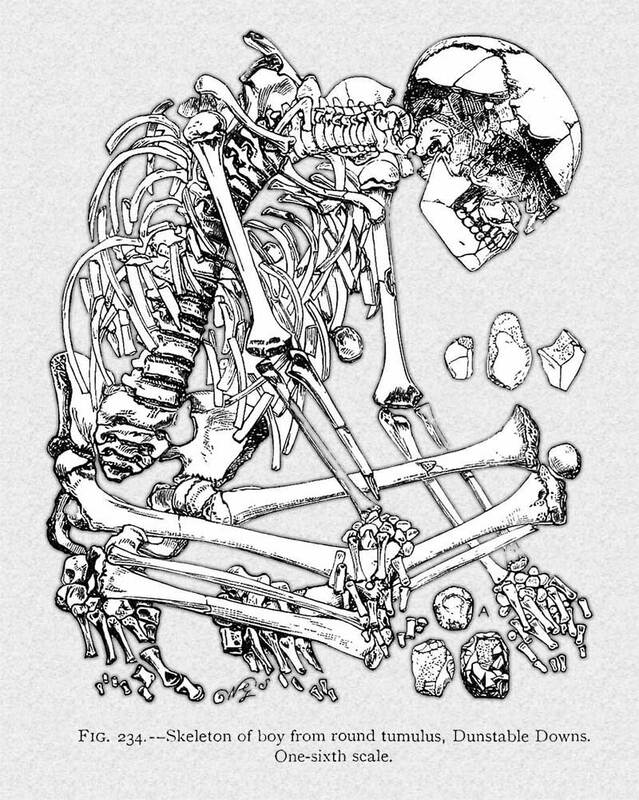 A few flint flakes, a few non-human bones, and a vast number of small pieces of Romano-British pottery were found near the skeleton. A sample of the pottery is engraved in Fig. 235. The second skeleton, of the age of which I am sure, is that of a young woman, clasping the almost perished relics of a child, as illustrated in the frontispiece. This skeleton came from a ruined round tumulus, also on the flat downs, and 760 feet north of the last. No. 6 on map. I was not present, in March 1887, when the first bones were disinterred, but I enlarged the grave and recovered certain bones which, together with the verbal descriptions of the original excavations, made the original position certain. Like the last, the circumference of the tumulus was 46 feet. Its height before it was levelled was 10 feet. The tumulus originally included a large central grave, 1 2 feet by 6 feet, which had been dug through the drift for about 1 foot and 2 ft. 6 ins., into the solid chalk. This grave had been rifled, for on re-clearing it, nothing beyond chalk rubble was found. Round the chief grave were six or seven others, each about 3 feet deep from the surface ; all these, with the exception of two, had been previously disturbed, and the contents, whatever they may have been, thrown out and destroyed. One grave on the east side of the mound had not been seriously disturbed, and from this the skeleton of the girl and child were extracted.Several persons might have been interred in the great central grave, but the graves belonging to the circumference were all shallow and small ; they were irregular in shape, and measured roughly about 3 or 4 feet square. No extended body could have been buried in any of them. The head of the crouching girl was to the north. The girl’s skeleton was recovered in 340 pieces. Each piece was cleaned and dried, and then soaked in the usual manner in thin, hot (almost boiling) gelatine, and when dry, conjoined. The bones of the child in front of the woman originally belonged to an individual of about five years. The thigh-bones of the presumed mother measured 1 ft. 3.75 ins. in length. This length, according to the plan of measurement adopted by Dr. James Beddoe, as given in the Journal of the Anthropological Institute vol. xvii. p. 202, gives the height for a woman of 4 ft. 11.5 ins. The skull, as illustrated in Fig. 236, shows a cephalic index of 67 ; it is therefore dolichocephalic, and I take the owner to have been one of the Bronze age dolichocephali; one of the late tall and light-haired Kelts, similar with the British refugees who fled from England to Brittany in the fifth century. The girl was indeed rather short, but Keltic girls were frequently made short by early marriage; good-looking girls were married before they had stopped growing, and before they had cut their wisdom teeth, and child-bearing arrested their further development. The girl was from eighteen to twenty-five years of age, but probably not less than twenty-five, as the hip-bulbs of the thigh-bones are concrete with the shafts. The child might have been buried alive with the mother. 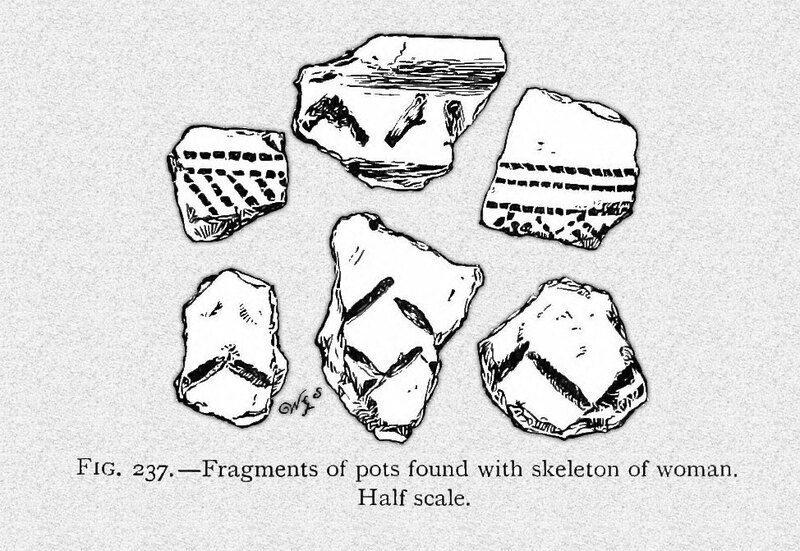 With the girl was found a broken and partly pulverised British pot, six : fragments of which are illustrated in Fig. 237. Three globular hammer- stones of flint were in the grave, two scrapers, two very rudely chipped celts, and a large number of flint flakes. Mr. F. T. Fossey, the owner of the land, who gave me permission to open the graves and dig, informs me that he found an arrow-head in the excavated material, but lost it again. I did not see it. Most curious of all was a large number of fossil Echini from the chalk. At first twelve were detected surrounding the girl, but at last, on extending the grave, nearly 100 were found. On repeatedly shovelling and raking over the earth from the entire tumulus, 200 or more were found, and most of these, undoubtedly, originally belonged to the girl’s grave, as none were found in the other graves. 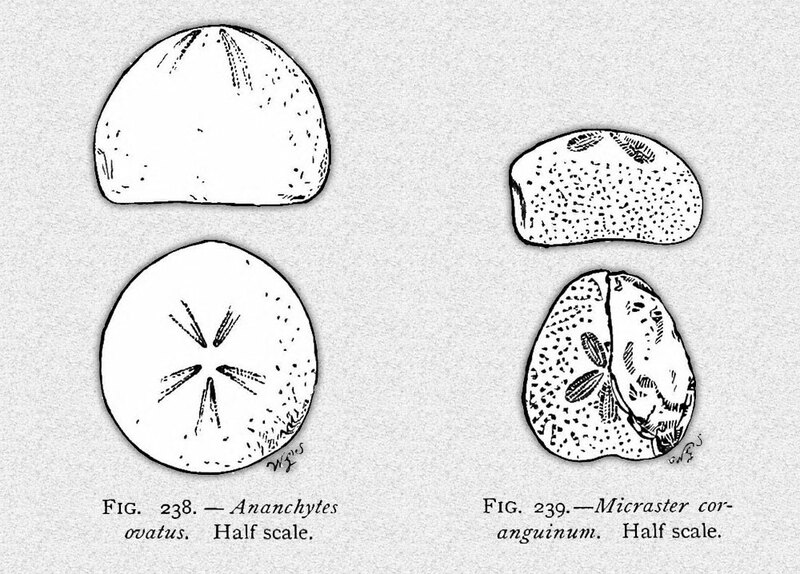 Two species were represented, one the ‘fairy -loaf,’ Ananchytes ovatus, Leske, Fig. 238, the other the ‘heart-urchin,’ Micraster coranguinum, Leske, Fig. 239. A single pebble of white quartz was also in the girl’s grave. Broken bones of Bos longifrons and deer were found in both the graves just described, and a lower incisor of a pig near the girl. No coins were found. Dr. Henry Woodward of the British Museum informs me of a Wiltshire tumulus in which the sides of the grave were made up of teeth of Lepidotus gigas, in one of which (forming the two sides of a locket) a kind of keyhole had been cut. Adjoining the grave of the girl, a few fragmentary bones of another human skeleton were found, and the next grave to this contained a burnt interment, the bones highly calcined, and mixed with wood ashes and burnt earth. Broken bones, horn cores, teeth, and skull fragments of Bos Iongifrons, Owen, are not uncommon over the entire Dunstable district. I engrave a right femur or thigh-bone, picked up by myself near Maiden Bower; both ends have been smashed off, presumably in pre-historic times, for the extraction of marrow; the shaft shows the marks of the flint knives used in scraping off the flesh. More on this burial soon – follow at Facebook, Twitter or Google + for updates.